This photo was taken on Apri 12, 2018 at 5:48 AM. The location was in a hotel garage, in the Georgetown section of Washington DC. The "Take It!" came as I glanced across the passage way to a small offset space next to the curb in the entrance to a parking garage in a luxury hotel which I visit for a few moments on a frequent basis. These two signs standing next to one another which are of the same outside dimentions with the same message, but with different designs and fonts for the printing prompted the question. Which sign is the most effective in bringing about the results requested on the face of the sign? It has taken some time to formulate the question about these fraternal twins. Before I delve into going to the manager of the garage to hopefully get an answer - I thought it would be fun to put it out as a question to those who view this sight to get their views one which one and why that choice. It is a rare opportunity to put the ball in your court, and I happily await your thoughts on this seemingly simple question. Sending each of you my best regards. PS: I could not help but add the S to which in the subject line for this piece. I am often amused as how our language is constructed which allows additions of one or more letters to a word to bring about a different meaning or emphasis to the beginning core of the word or expression. I guess one sign wasn't enough. My first job was in a parking garage. I think they put them both on the same side when they close. When they open one will then go on the entrance side. 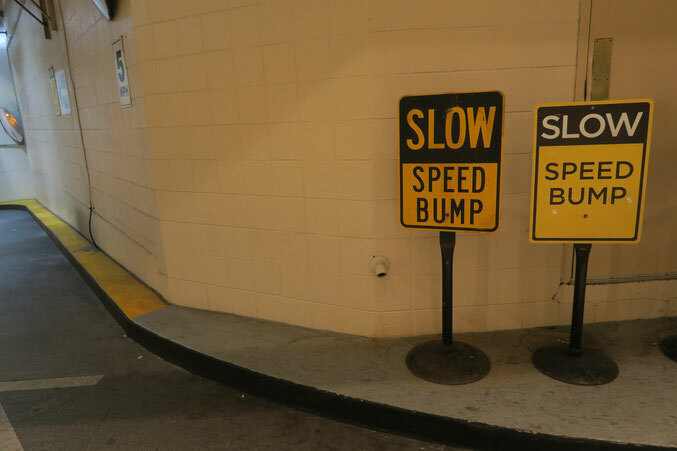 How many people had to fly over that speed bump before they went "maybe we need another one." ? My husband was full of jokes after looking at this pic.